Best Mad Libs story ever! If you’ve never heard of Mad Libs, it’s basically a kind of kids’ activity book that helps you create silly stories. The booklet asks for examples of different kinds of words (parts of speech like “adjective” or more specific kinds of words like “color”). The words will be used in a specially written story, but you don’t know exactly how they will be used. After all the words have been written down, you copy them into the story and read it aloud to see how it sounds. Every once in a while, I tell someone the story of the time my mom and I did a Mad Libs story that made us laugh like crazy. In fact, there’s already a blog post about it. See below for more on that story, which I rediscovered on my recent trip to Atlanta. 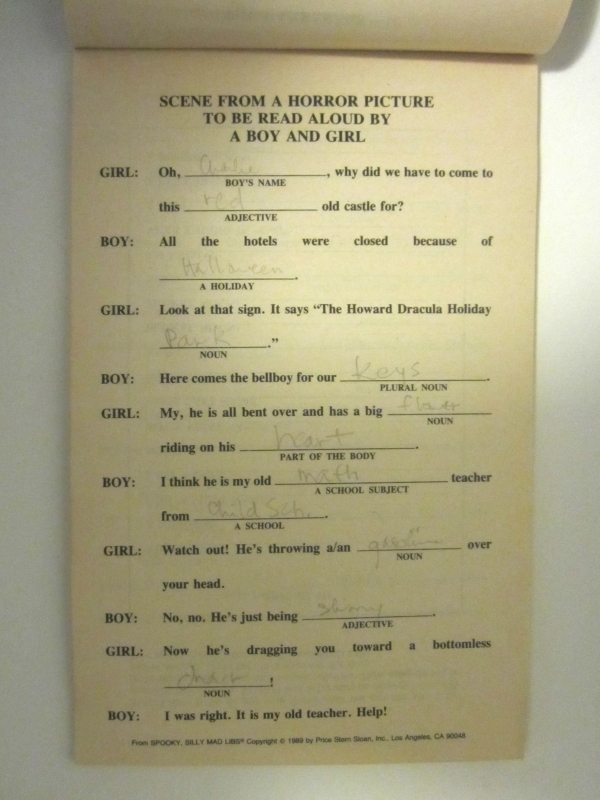 The best Mad Libs story ever! It turned out that the villain in the story was dragging one of the characters towards a bottomless chair. The phrase “bottomless chair” makes perfect sense, especially if (like me) you grew up in a house that had wicker-bottomed chairs, some of which had been sat in too heavily or too often and had broken. However, the idea of a villain threatening to push his victim into a bottomless chair is ridiculous—the absolute opposite of scary. We laughed our heads off. I didn’t know it then (because I was only, maybe, 8 years old), but my mom and I had created a perfect example of what is known as “bathos”, an amusing anti-climax typically brought about by an accidental change in tone. Although I have a vivid memory of what happened and why it was funny, I assumed the story itself was long gone. Not so. 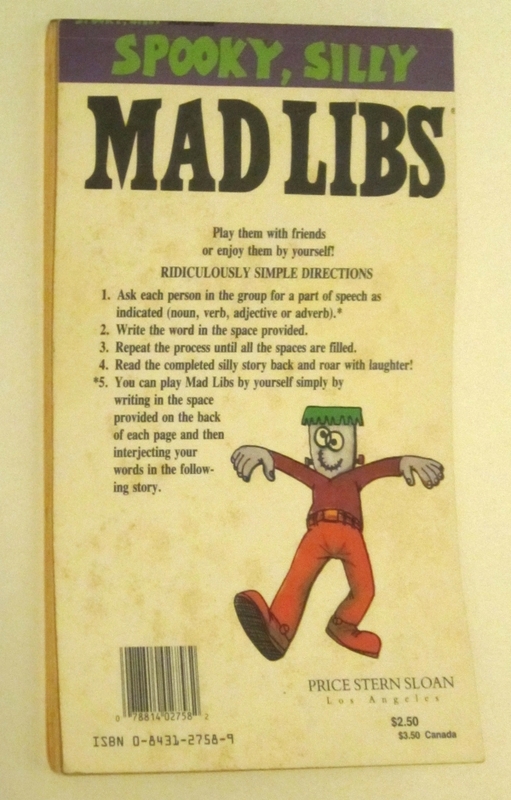 Going through some old stuff in my room, I found a Mad Libs book. Eagerly, I started flipping through the pages, looking for a story with a bottomless chair in it. 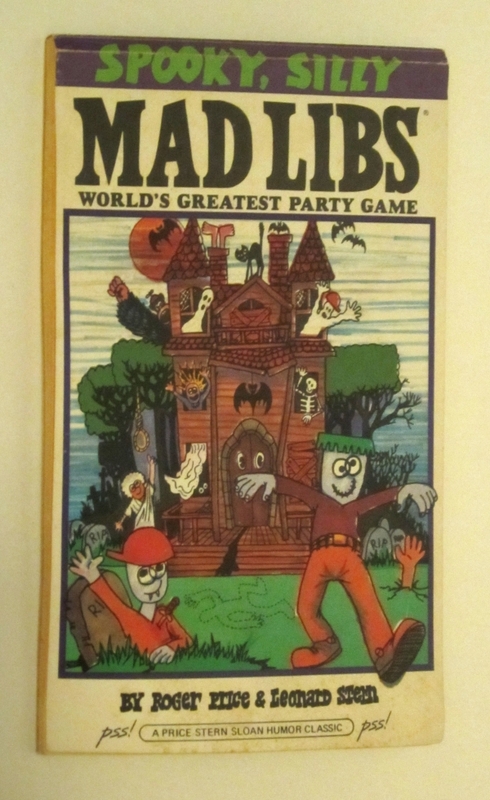 I was gratified to find that this was, indeed, the specific Mad Libs book I remembered. Below are images of the immortal page itself as well as the 1989 Mad Libs booklet it’s in. The blanks have been filled in by my mom with the following words chosen by me: Charlie (my brother’s name), red, Halloween, Park, keys, flower, heart, math, The Children’s School (the name of my elementary school), gasoline (an uncountable noun, which the story wasn’t expecting—the most inventive word in the whole batch), shiny, and, of course, chair. I don’t think that’s how “interjecting” should be used. “Inserting” or even “injecting” would fit better. Ah, well. Mad Libs has never been about choosing the best word for the sentence.